Potatoes (Solanum tuberosum) are an annual root vegetable that is easy to grow in Pennsylvania. The key is to plant seed potatoes as early as possible, in a location that will give them the best chance of producing a healthy crop of tubers before sunshine overwhelms the plants. 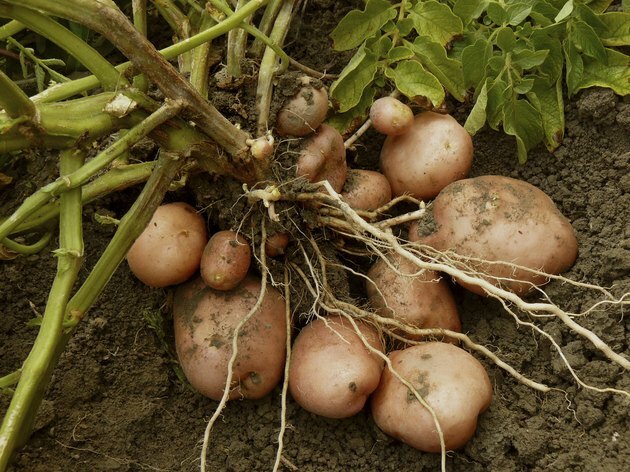 Potatoes develop best in loose, loamy soils. Potatoes don't do well in summer heat, so it's best to get them in the ground early to give them a good head start on the season. Plants will emerge about two or three weeks after planting, so the best planting time is approximately two weeks before the last frost in the spring, or when soil temperatures reach 40 degrees Fahrenheit. That date will vary depending on which part of the state you live; the average last frost date is April 14 in Philadelphia, May 21 in Scranton, May 26 in Pittsburgh and June 7 in Ridgway. Plant potatoes in a location that gets between six and eight hours of sun exposure per day. 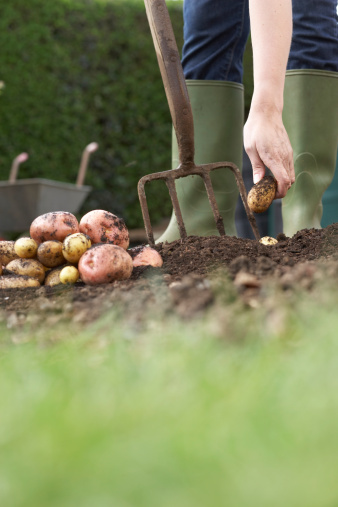 A light-textured loam is the best kind of soil in which to grow potatoes because the tubers will form better and more easily in a light soil than in a heavy, dense clay soil. Potatoes also prefer acidic soil with a pH level between 4.8 and 5.5. Cut up large seed potatoes into pieces about 2 or 3 inches long with at least one eye on each piece. Do not use store-bought spuds. Putting the pieces in a warm, sunny, indoor location for a week before planting will make the potato more likely to sprout quickly after planting. Dig a trench 4 to 6 inches deep, and place the pieces in the trench with their cut sides down, spacing the pieces about a foot apart. Cover them with 4 inches of soil. As the plants grow, use a hoe to pile soil around the base of the plant; this will give the tubers room to develop and will prevent them from being exposed to sunlight, which will make them inedible. Potatoes do well when fed with a balanced fertilizer. The Penn State Extension service recommends a mixture of 4 parts cottonseed meal, 2 parts bone meal, 2 parts greensand and 2 parts kelp meal as an organic fertilizer that can be added to the trench before you plant and as a side dressing at the beginning of the flowering stage. Add 13 or 14 pounds of the mixture to every 40-foot planting row at the time of planting. Water the seed potatoes thoroughly at the time of planting, and continue to water through the growing season so that the plants get about an inch of water per week.